Choice of Daylight or Tungsten. Choice of Manual or Pole Operation. The 400F Studio Fresnel Luminaire ships with PowerCON input tail (1 meter), Mounting Yoke with TV Spigot adapter, 4 leaf Barndoor, & instruction sheet. Broadcast-grade fresnel, providing a world class LED alternative to the traditional tungsten fresnels, reducing the power consumption by approximately 80%. Equipped with a smart Strand control user-interface, the color LCD display with 8 soft keys and decoder wheel enables intuitive operation. A USB port also allows for future firmware upgrades or performance data file downloads. 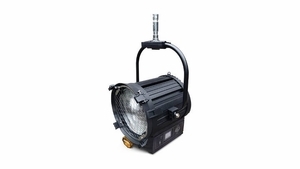 The 400F LED TV fresnel consists of both a tungsten and daylight version. It can be pole-operated or manually-operated, with a pole-operated focusing knob at the front and manual knob at the rear.